What desserts are available at Frost Bake Shop? How can I order my wedding or party cake? What is your refund policy for wedding cake deposits? Do you have same day cakes available? What cake fillings do you offer? Can I taste the cakes and do I need an appointment? Can I bring in or email a photo for Frost Bakeshop to recreate my perfect cake? Do you ship to other areas of the country? What is your Bartlett facility? Can I pick up cakes in Bartlett? Do you use high-fructose corn syrup (HFCS)? 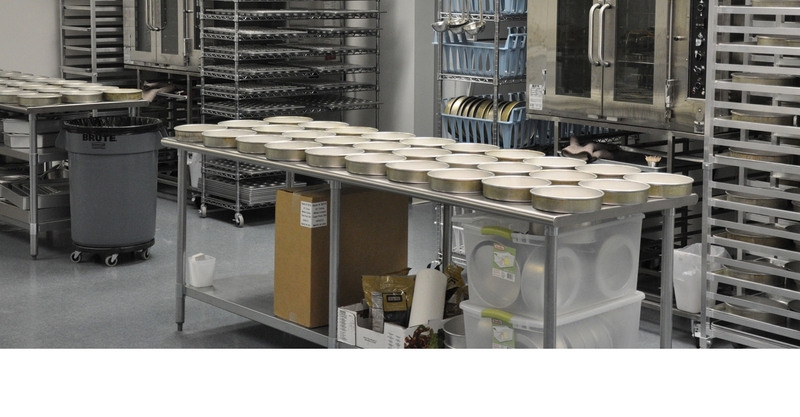 All of the 6" & 9" layer cakes, cupcakes, cheesecakes, pies, cookies and boxed desserts shown on the website menu are available everyday at Frost Bake Shop. While we usually don't run our of most items, you should call ahead (901-682-4545) to check availability if you must have a particular item. Customer service is very important to us. In addition to offering the best tasting cakes and desserts available, we want your cake to look exactly the way you want it to look. To help us ensure your satisfaction, we believe that communication is key, and this is best done in person and not through email. To setup a wedding cake tasting call 901-652-8815. 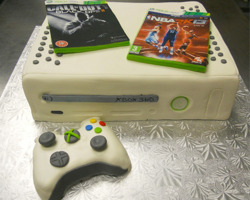 To order party cakes, please visit the Frost location where you wish to pick up your cake. We do book up fast, so we suggest that you place & pay for your order a minimum two weeks (14 days) in advance. If space is available, we can fill customized orders in as little as 5 days. Our 9" layer cakes, with no extra decoration, are always available and can be picked up at either Frost during our normal business hours. Customers requesting a custom cake for delivery in less than 14 days will need to provide payment in full within 24 hours. After that,we can not guarantee that we will have availability. Party cakes: Payment in full is due at least 14 business days before the pickup date. Certain flavors, sizes and carved cakes must be ordered and paid for at least 14 business days before pickup. If we have availability we may take orders and payment in as little as 5 business days before pickup. For wedding cakes we accept credit cards, checks and cash. For all other specialty cakes we accept credit cards and cash. (We will accept a check for a party cake if the payment is made 14 days in advance.) Payment can be made over the phone by giving us the required credit card information as long as there is a saved cake quotation in our system. Frost Bake Shop has the most lenient refund policy in the wedding industry. Basically, if we haven't done any work on your wedding cake you get your money back (minus a $75 administrative fee). Since most cakes are made only a few days before the actual event there is no risk to you no matter how far in advance you give us a deposit. Our refund policy is clearly stated on the paperwork you receive the day you order your wedding cake. Our 9" layer cakes and some 6" cakes are always available. We can also write a message on top of our 9" cakes and add glitter, if desired, while you wait, for no extra charge. Banana: Almost a pound of bananas in each cake, with chopped walnuts and our smooth cream-cheese frosting. No other banana cake compares. Caramel: A moist yellow cake frosted with buttery caramel frosting. Carrot: This cake is loaded with carrots for incredible moistness and has chopped raisins and walnuts. Finished with cream cheese frosting. This is a very heavy, rich and spicy cake you are sure to enjoy. Chocolate: We should call this double Dutch chocolate. The cake is made with extra dark Dutch cocoa, while the frosting is made with a medium Dutch cocoa. Your taste buds will sing from the first bite! Coconut: A moist yellow coconut batter and coconut cream on the layers make this cake an unrivaled taste sensation. Vanilla frosting covers the top and sides and the whole is than covered with Angel Flake coconut. Lemon: Fresh lemon zest in the cake batter and frosting, and fresh lemon juice on the cake layers make this a lemon cake without equal. Memphis Cream: Take the best Banana Walnut Cake available anywhere, fill it with peanut butter frosting and top with chocolate ganache. Pumpkin (seasonal): Rich, flavorful and drop dead delicious. The taste of pumpkin pie in a cake! Cream cheese frosting adds just the right amount of sweetness. Although only available October through December, we get requests for this cake year round. Red Velvet: This traditional red velvet cake is made with a touch of Dutch process cocoa and topped with our creamy vanilla frosting. Strawberry: The secret to this cake is the strawberries. A pound of strawberries in each cake with strawberry filling in the middle. Top with our signature strawberry frosting and you have the best Strawberry Cake in the Mid-South. Vanilla: A moist yellow cake, soaked with vanilla cream and frosted with our signature vanilla frosting - simple, yet simply delicious. 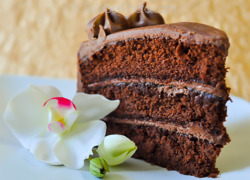 Vanilla Cake with Chocolate Frosting (6" only): Our moist yellow cake finished with our luscious chocolate frosting. 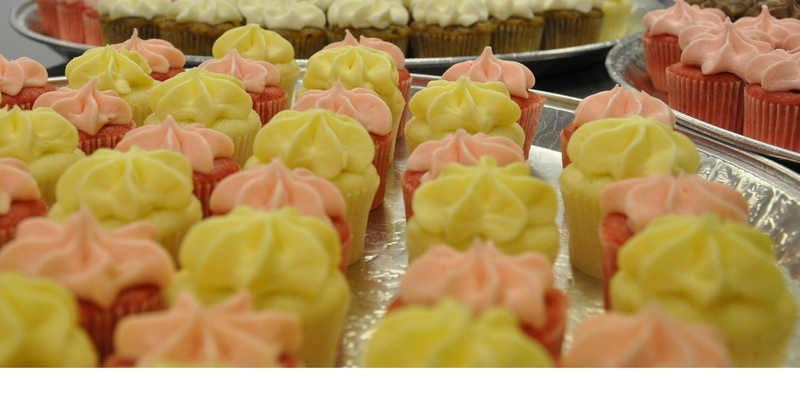 Our fillings for wedding cakes are limited to strawberry and raspberry. Rolled fondant or fondant icing, is commonly used to decorate wedding cakes and other specialty cakes. It includes gelatin (or agar in vegetarian recipes) and food-grade glycerine, which keep the sugar pliable and creates a dough-like consistency. "Homemade" fondant is usually made using powdered sugar and melted marshmallows. Rolled fondant is rolled out like a pie crust and used to cover the cake. It is applied over one or more coatings of frosting and gives a cake a very smooth finished look. Yes. We encourage you to make a free appointment to taste our cakes. When you make an appointment we will ask which of our cakes you want to taste. For Weddings: Tastings are strawberry, chocolate and vanilla. 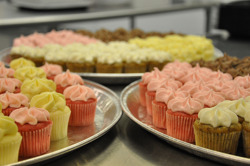 Guests then get to take home up to 4 additional flavors in our standard size cupcakes. For Party cakes: Guests can try 1 standard size cupcake flavor during their in-store consultation. Additional flavors can be tried by purchasing individul cupcakes. Important: All wedding tastings are held at our Collierville location, 1016 W Poplar Ave in Collierville. Please do not go to our East Memphis location in Laurelwood Shopping Center for your Wedding Tasting appointment. For other events you can schedule a free consultation at either of our locations. Can I bring in or email a photo for Frost Bake Shop to recreate my perfect cake? Yes, photos are very useful. They help us to understand how to create the cake you are imagining. Remember, if you can dream it we can make it! Some questions we will ask you – Your contact name, phone number, email address, the date of event & pick up date, number of servings needed, a picture for inspiration, and other design information. Do you do custom cake, cupcake or cookie designs? 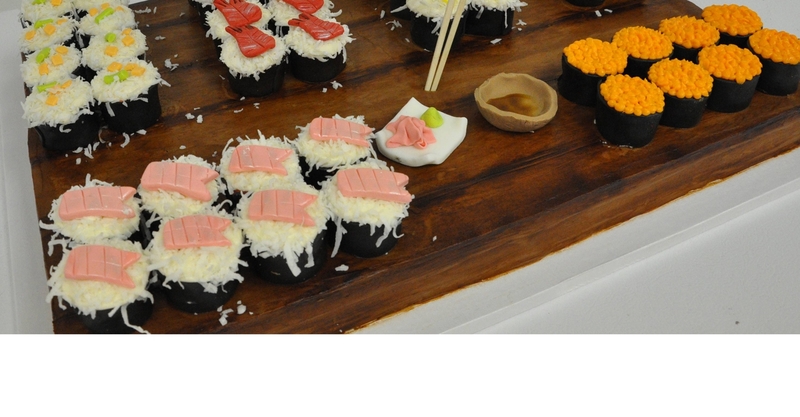 Yes, we specialize in custom designs so each cake, cupcake or cookie is unique. Design pricing varies greatly depending upon the number of servings and the complexity of the design. Please visit one of our stores and we will be happy to provide a quote. We do deliver custom cakes with a $50 delivery fee within the greater Memphis area, Monday through Saturday; Sunday deliveries start at $75. If outside Memphis, then the delivery fee is based on mileage. We do not make deliveries of our standard desserts. However, customers can make arrangements with Blue Sky Couriers to have deliveries made. 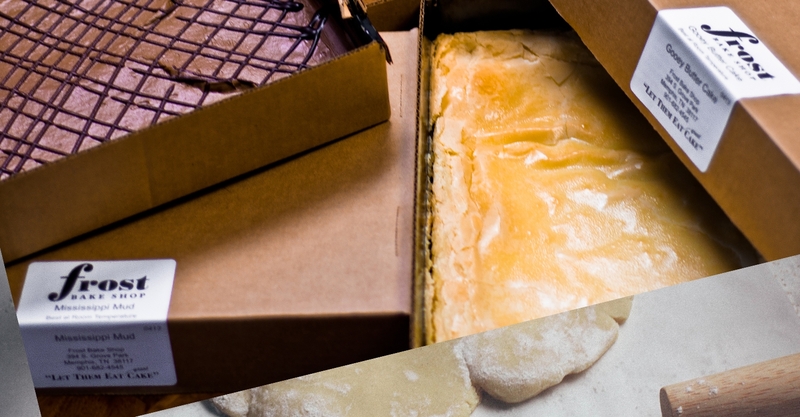 Courier delivery fees vary depending upon the distance from the bakery. Currently we do not ship our desserts. Customers can order online through our website for pickup at one of our locations. To order for store pickup click on one of our store locations in the top left corner of any page. 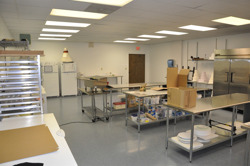 Our facility in Bartlett is our 7,800 sq. ft. production facility. 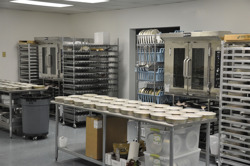 All of our cakes and other products are baked in this facility. In addition, all of our decorating classes are held at this location. Please call us if you would like a tour of this facility. No retail sales are available in Bartlett. No. All cakes must be picked up at the Frost location where you ordered the cake. We do, however, invite customers to visit and tour our facility in Bartlett. No. 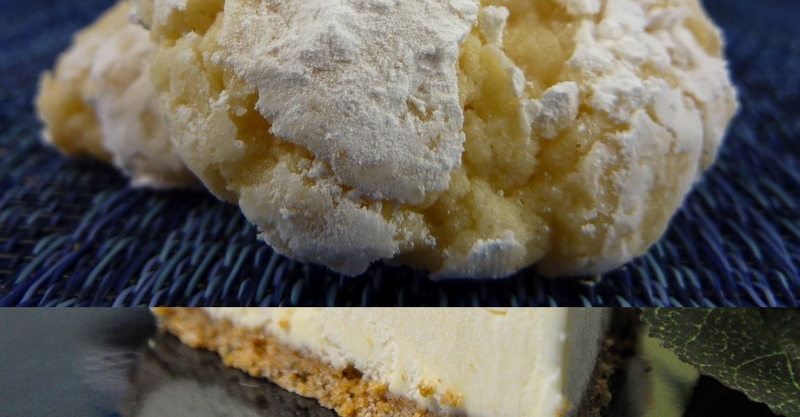 We only use granulated sugar in our cakes, frostings, and fillings. Even our pecan pie is made without corn syrup.